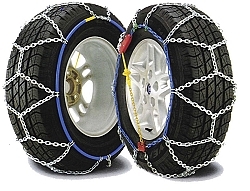 We supply only the best quality in tire chains for both on road and off road applications. Our prices are very competitive and we are proud of our high level of customer service! And now with even lower prices! We carry chains for Passenger Cars, Light Trucks, SUV, ATV, Skid Steers, and Lawn and Garden Tractor applications. And now Large Transport Trucks! Just choose your category from the menu at the left to get started. When you are on the product page please scroll down to see a description of the part and customer reviews.